I discovered Stu Mittleman when I attended Tony Robbins’ Unleash The Power Within course. Stu was introduced as the man who ran 1100 miles in 10 days. He is an ultra-endurance racer and shares his learnings in this book. Visualise, visualise and visualise: He goes further than visualisation where he takes students who are running through a marathon to wear the clothes and run the circuit they will be running on race day. Put processes for success: don’t aim for goals, setup process changes that will take you to your goal. Then trust the process. For example if picking up running, focus on breathing, heart rate as opposed to distance. Focus on metaphors: Using metaphors to get through challenges makes meeting challenges easier. For example when running hills, visualise that you are on a roller coaster - slow down going up, speed up coming down. Not only will this be enjoyable but the metaphor provides the framework to meet the challenge. Move forward in small increments: The key to success lies in creating a succession of little victories, each one empowering the next.Move forward in small increments: Running a thousand miles was too far beyond his ability to comprehend so he focused on the next mile. Listen to your body: pay attention to what the body says and react accordingly. If you are tired, don’t do an intense workout perhaps a gentle walk is good enough. Stress and Adrenal glands: Too often people are walking around with fatigued adrenal glands. This makes people susceptible to illnesses. Sleep well to recover from adrenal fatigue. 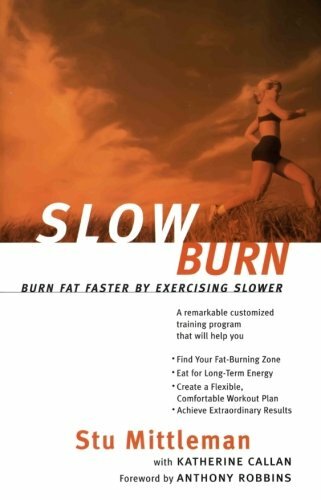 Operate in a fat burning zone: He trains in a fat burning zone called MEP - clarified in the next bullet point. Beginner Workouts: (highly condensed). Warm up, Cool down of 15 minutes. Run in MAP for 20-60 minutes about 3 times a week. Do a long run on the weekend in the MEP for 20-60 minutes. Just move to access energy: Movement unlocks our senses, makes us feel alive, and allows us to rejoice in the here and now. Like a computer that goes into sleep mode when it isn’t being used, many people settle into a state of lethargy and interpret their lack of energy as a sign that their body needs to be shut off or rested when, in reality, It’s crying out to be used. If you are just starting out and have never allowed movement to become a part of your life, the only thing that matters is that you find an activity that you enjoy doing and get out there and do it! It doesn’t have to be complicated. Walk, run, bike, or swim. Stay comfortable, keep moving, and you will prosper. If you run but are not already engaged in a training program, I’ll share techniques to make movement more effortless and joyful, simple, and sublime. Eat an alkaline diet: An alkaline diet is primarily vegetarian. Eat by your blood type: I followed this up by reading the “Eat for your blood type” - a topic by itself and well worth paying attention to. Your body burns what you feed it: if you feed body sugar it burns sugar, if you feed it fat it burns fat. I normally like to copy my highlights from the book in this section but this book was so compelling that at some point my note-copying became a copy-paste of the book. So I am going to focus on the key elements from the book and highly recommend reading the book instead. Our attitude toward what we think is possible determines what we do. If you believe you can run a mile, you will. If you think you can’t, you wont. Your mind will not let you. Expanding the boundaries of what you believe to be possible is critical in putting yourself in a position to go the distance and do the extraordinary. We need to stretch beyond self-imposed limitations. Mind, body, and nutrition are areas of training that you must develop and fine-tune, manage, and balance, much in the same way a master triathlete does his swimming, biking, and running. If you neglect one or two endeavors, they will come back to haunt you. Any system is only as strong as its weakest link. So I get creative. “We are not going to train to run a marathon,” I announce to the group of startled would-be marathoners. “We are going to learn how to participate in and enjoy a 26.2 mile-long street festival.” From that point on it gets easier. What we have to do is chunk-down our goal, making it monumental and manageable at the same time. I know that nine weeks isn’t enough to train them in a conventional marathon-training program. We plan on entering the staging ground of the event not as untested warriors going off to battle, but as youthful explorers about to journey through their first adventure. The feeling we want to create inside is one of curiosity and awe, excitement and calm, jubilation and anticipation. These seem infinitely more attractive and energizing than the emotional state of fear, anxiety, trepidation, and self-doubt. We spend time every day visualizing step-by-step what it is going to be like to do the event. I want them to have a plan in place prior to the race and I want them to “see” themselves confidently and assertively implementing the plan. Creative visualization involves constructing an image in your mind’s eye of what it will be like when you reach your ultimate goal. Visualization concentrates the energy that springs from your desires and increases the likelihood that your dreams will be realized. With the vision of the future firmly embedded in your imagination, your mind will lead your body to the fulfillment of our thoughts. I share with the group an exercise that I use with clients prior to a big event. “I want you to ‘see’ what it is like to enter the staging area. I want you to ‘feel’ how calm and excited you can be as you make your way to the starting line. I want you to ‘hear’ the ecstatic cheers of the crowd as you make your way through the carnival that is New York on this most magnificent of marathon days. “But most of all,” I continue, “I want you to see yourself in control, handling anything and everything that comes your way right up to the moment you see yourself crossing that finish line! I take them through their training paces for the next nine weeks, ending with a run over the last three miles of the course a few days prior to the event. During that last run, I remind everyone to imagine that they are actually finishing the marathon. I ask them to “see” the finish line up ahead, to “hear” the crowd’s roar of approval as they make their way up the last rise towards the finish, and “feel” the joy and exuberance running through their bodies as they finally cross the blue line. The next time someone tells you can’t do this or that, you can fire back, “I can. I have, and I will again. Step out of the secure box in which you live and make a commitment to do something extraordinary. don’t be afraid to reach for the stars! Approach exercise in the same way you would any other partner, colleague, lover, or mate. Sure, there are things you want to accomplish and feel you need. But can you create a successful relationship if all you do is force your wants and needs on your partner? Of course not! The ideal relationship is a dance, a give-and-take, not a do-as-I-say arrangement. You must get to know your partner, discover where you agree and disagree. You must communicate what you think will make you happy, but you must also look, listen, and feel for what your partner is saying. Sometimes you will agree. You will probably discover that your body actually thrives on many of your ambitions and desires; at other times you will learn it does not. The goal of this relationship is to act as one. The challenge for you is to discover what kind of movement is you. The way to do this is to move. Experiment. Try out different things. If you are afraid of a sport or distance, go to it. Something that generates a potent response must have meaning for you; it is revealing something about you and about your body. Put yourself in a position to discover a new aspect of yourself, a side of yourself you didn’t know before. Participate, take action, and do something—anything! Shifting the focus from the experts to you makes you the center of attention. The expert that’s right for you is you. It’s the person in the mirror. The direction of your path is to not focus on the expert but to focus on yourself. In order to discover what’s best for you, you must learn to be in touch with your body and capable of processing the information your body sends you. The challenge is to be constantly aware of what is going on in your body and being educated about what is current in the world of health of fitness. Do you wake up fatigued or tired? Does your energy level fluctuate over the course of the day? Do you need to eat to get energy? Do you lose energy between meals, especially after high-carbohydrate or sugar-filled ones? Do you have difficulty concentrating or thinking clearly? Are you moody, irritable, or depressed? Unless you answer “no” to all of these questions, you need to adjust your strategies. Common causes of inconsistent energy and fatigue are diets high in sugar, an overreliance on caffeine, and a training program dependent on anaerobic, sugar-burning exercise. Your main objective is to raise your level of awareness about who you are and how your body works. You want to learn what kind of foods energize you, bring you pleasure, and keep you healthy and free of colds, flus, and allergies. An empowering one is driven by the excitement of self-discovery. It steers you along the path of possibilities and encourages you to become present to and participate in the creation of your future life. When your body tells you something, you have an opportunity. If you seize that opportunity, you will move one step closer to being the master of your own fate. These experts can have input; we must have the final say. Focus on your breathing. Imagine a triangle formed by your hips and belly button. Inside of the triangle is a “ball.” As you breathe in, fill the “ball” up with air. Feel the “ball” expand as you breathe in, and “feel” the air coming out of the ball as you breathe out. Inhale to the count of four, hold to the count of eight, and exhale to the count of six. Assess your relationship to the ground. Stand up. Feel your body weight being supported by your feet. Let your arms hang comfortably by your side, and evenly distribute your weight on each foot. Bend your knees slightly, and shift your weight back so that your body weight is being almost entirely supported by your heels. Wiggle your toes. Notice how stable and relaxed you feel. Now shift your weight forward so you end up on your tiptoes. Your weight is now being borne by the front of your foot. Notice the difference in how you feel. In which stance were you more stable and relaxed, and in which one were you more tense and unstable? Observe your surroundings. How does the world look? Notice its depth and colors. Take in as much information as you can. How many different colors can you see? Listen for sounds, nearby and far away. Can you make out three distinct sounds? How about four? Five? Breathe and be aware of the different fragrances that surround you. What do they remind you of? How do they make you feel? Take a mental inventory of your body. If you find an area that’s more tense than another, imagine your breath filling up the area and relaxing it. Release all tension as you exhale. Note the fluidity and warmth as your body continues to move. Play with your arm position. Check the tension in your hands and in your jaw. Relax. When we focus more on the process than the outcome, we realize that true empowerment does not exist in the goals that lie outside of our body. True empowerment comes from waking up each and every morning and thinking, moving, and eating in ways that give us energy and allow total integration in a life mission that instills passion and generates a life we love. Keep your mind focused on the process. You will discover that a process orientation allows more room to be creative, have fun, handle adversity, and adjust to life’s inevitable twists and turns. Instead of being self-absorbed with the future, cultivate a process-oriented mindset, and replace outcome goals with process-oriented ones. Examples of process goals include the following: Wake up with a smile. Start each day acknowledging how happy you are to be alive. Incorporate time for movement every day. Drink plenty of water. Eat a balanced, healthy diet. Be vigilant in accessing the experience you are having. Interact and have fun with the people around you. Nothing ensures success better than success. Each successful day brings you closer to your goal of optimal health and moving through life with genuine satisfaction and happiness. Be aware of where you are in the breathing cycle. Let results emerge gradually—don’t force things! Focus on the experience you are having, not on the results you want later. It’s not about how much you’re doing, It’s about how well you are experiencing it. Focus on comfort and joy, not on pain and discomfort. Be positive, stay present—the future is yet to come and still remains under your control. The more you focus on the process, the faster the results will come. The key to success lies in creating a succession of little victories, each one empowering the next.I committed myself to running one mile one thousand times. Running a thousand miles was too far beyond my ability to comprehend, like a trillion dollars. I know what the words say, but I can’t really comprehend what they mean. There is magic in creating a structure that guides you toward a productive and infinitely manageable state and away from overextending yourself to the point where you’ll need too much time to recover. This is the heart of endurance—it is not an attempt to discover how much pain and discomfort we can take before we break down and need to recover. Endurance isn’t about achieving and holding on to a stressful state for as long as you can. Quite the opposite. Optimizing productivity for a prolonged period requires that you maintain a much more manageable state over smaller repeatable increments. Create a doable and repeatable pattern right away, before this event slips away totally,” he reminds me. “It doesn’t have to be much.The main challenge in building your repeatable pattern is to build in rest and recovery stages that can be taken voluntarily, before they are absolutely necessary. Conceive of each day as a stretch of road with aid stations every mile. What do you want to drink and eat? How much will you walk? The aid stations can act as an oasis where you can reorganize and regroup. Be forewarned: the adjustment is as much mental as it is physical. As people switch over from a speed to an endurance mindset, one of the main challenges has to do with ego. Running within a comfort zone defined by a target heart rate means that at first you’ll probably be moving much more slowly than before. You may end up running faster, but that probably won’t be the case at the start. By allowing your body to start out more slowly in the zones, you will learn to become more productive in them and eventually speed up. What about you? What is your long-term plan? Remind yourself at every turn that the decisions you make must benefit you not just today but tomorrow and the next day and the next. Surround yourself with people who will support you on your long-term mission. Last, but not least, you must realize that in order to realize fully the power of the plan, you must have the flexibility to change the plan when it isn’t working. Everything you do is “good,” as is everything that happens to you. You don’t win or lose, you only choose to grow, gain power, and flourish as a person, or not. Who you are, the kind of person you become, emerges out of how you respond to the events that happen in your life. How well you perform has little to do with it. I am about to share with you the secret for accessing energy whenever you want it: just move! Movement unlocks our senses, makes us feel alive, and allows us to rejoice in the here and now. Like a computer that goes into sleep mode when it isn’t being used, many people settle into a state of lethargy and interpret their lack of energy as a sign that their body needs to be shut off or rested when, in reality, It’s crying out to be used. If you are just starting out and have never allowed movement to become a part of your life, the only thing that matters is that you find an activity that you enjoy doing and get out there and do it! It doesn’t have to be complicated. Walk, run, bike, or swim. Stay comfortable, keep moving, and you will prosper. If you run but are not already engaged in a training program, I’ll share techniques to make movement more effortless and joyful, simple, and sublime. Often, instead of finding out, we learn to live with the ailments and do our best to cover them up with drugs. We adjust our lifestyle to avoid the stress of movement and set ourselves up for further pain and immobility. AK presumes there are relationships between certain organs and certain muscles. The information a stiff muscle offers may well be more than just a gentle (maybe not so gentle) reminder that the next time you’d better be more prepared before working out. The adrenal glands, located above each kidney, are flattened, cap-like tissues that help to manage stress by secreting hormones that stabilize the blood-sugar level. These hormones affect the heart, blood vessels, other glands, and nervous system. Some of these hormones are called catecholemines, composed of norepinephrine (NE) and epinephrine (E), which serve to either excite (E) or calm down (NE) the nervous system. Other hormones, mineralocorticoids (specifically corticosterone) serve as anti-inflammatory agents that can alleviate the amount of pain and discomfort associated with physical training. The adrenals also secrete a hormone that stabilizes blood sugar during periods of stress. This hormone (a glucocorticoid) is called Cortisol, which is a glucose synthesizer and stimulates the production of more blood sugar. Under normally functioning conditions, Cortisol also prevents existing blood sugar from being used up and encourages the body to burn fat instead. It raises the level of protein carried by the blood in order to promote tissue repair and growth. Once you have the go-ahead, you can gauge the correct amount of force to exert against a selected indicator muscle by keeping the pressure around two to four pounds. Here’s a helpful benchmark: most adult arms weight between one and two pounds, so the feeling should be one to four times the amount of effort it takes to just hold your arm up, perpendicular to your body. Another neat trick is to either imagine or actually practice using a postal scale. Place your hand on the top of the scale, arm straight, hand extended. Starting very easily, gradually increase the pressure and push down on the top of the scale until you reach four pounds. Then ease up and go back down to one pound. Repeat. After three to five trials, you will be better at keeping the tension in the desired range. Reflex points for the key organ groups of adrenals, liver, kidney, colon, and stomach are located above and approximately one inch to the left and right of the navel. Closest to the navel and below the other two are the kidney pressure points (or reflexes). One inch above the kidney reflex points are the adrenal points (one inch to the left and right and two inches above the navel). Three inches above and one inch to the left and right of the navel are the reflex points for the liver. Stimulation of tender accupressure points for twenty to thirty seconds two to three times a day activates lymphatic (the body’s sewage system), blood, and energy flow to the muscles, organs, and glands. For daily maintenance, stimulate all the reflexes identified in the following illustration for three to five seconds. If a spot is especially tender, continue to “work” the spot for sixty seconds or until the tenderness is reduced. During athletic competition, stimulation can continue for two to three minutes. Have a thumbs-width distance between your toes and the front of the shoe. The most important technique for getting in touch with the body. His reply was instantaneous: “Become aware of where you are in the breathing cycle. The technique that all these physical disciplines advocate is belly breathing. Belly breathing is used in everything from opera singing to power lifting—the low-to-the-belly method of breathing crosses all physical cultures. Breathing to the belly calms and energizes at the same time. Once you get into one of the two starting positions, place one hand on your navel. Imagine a triangle formed by your hips and your belly button. Place your hands on your hips. See a triangle in your mind’s eye. The top of the triangle is your belly button. The sides flare down and back to the outside of your body, toward where your hands rest on your hips. The line that connects the place where your hands are forms the base of the triangle. Imagine a “ball” encased inside this triangle. As you breathe in, see yourself filling the “ball” up with air. As you inhale, the “ball” inflates. It gets larger, becomes more voluminous, expansive, and lighter. As you exhale, the air releases, the “ball” deflates, air flows out, and pressure is released. Breathe in, the “ball” gets bigger. Breathe out, the “ball” gets smaller. Most of the time, I maintain a conscious connection with my body so I can continue moving forward with a sense of effortlessness, comfort, and natural flow. I concentrate on my breathing, the relationship of my feet to the ground, the position of my arms, my hand, my jaw, and constantly monitor the sights, sounds, and feelings of the world around me. I do not let myself become preoccupied with how much longer I have to go or whether I can push myself harder. Imagine you’re standing on the top of the world as it is rotating. With each step, all you are doing is lifting your feet up just enough to let the earth pass beneath you. Imagine everything is flowing toward you as though you’re on a giant treadmill. You’re not going anywhere; everything in the world is coming toward you. Let your heel be the first part of your body that makes contact with the ground. Feel your body weight being supported by your heel. Let your body weight shift forward over the arch of your foot to the front of your foot. RUN AS THOUGH YOU ARE ON A ROLLER COASTER. It’s not how fast you’re going uphill, but how well you master maintaining the same state as you move. The best way to maintain your target zone as you’re moving up and down hills is to make changes in the length of your stride. While sugar-based energy is fast and effective, it has long-term drawbacks, chiefly inconsistent energy levels and making the body more acidic, which could increase your susceptibility to colds, flus, and injuries. The long term does matter! What prevents most people from maintaining and enjoying a lifetime exercise program is their reliance on sugar-based energy. The human body has two distinct energy-producing systems: one is based on burning sugar, generally referred to as the anaerobic system; the other based on fat, or the aerobic system. To begin with, your body does not have a lot of sugar to use as energy. Of the approximately 160,000 calories stored in the body, only about 2,500 come from sugar (23,000 are protein; 134,500 are from fat). The by-products of sugar metabolism can impair your ability to be strong and optimistic in the long run of life. By design the day-to-day function of your sugar-based energy system is to fuel the nervous system and brain and provide energy in case of an emergency. Now if you go out for a long, fast run without a fat-mobilizing warmup, your body immediately taps into its sugar stores to provide energy for you to move. In reality these are warning signals that the body knows its emergency fuel supply is being depleted and that it can no longer protect itself. The only answer is to stop moving or to take in an exogenous energy source: carbohydrates (all carbohydrates are eventually broken down to sugar), an energy bar, or a sugary energy-replacement drink. Thus, a vicious circle begins. Using the heart-rate monitor, we identify my fat-burning zones and make sure I train in them several days a week. In these zones, my breathing is low to the belly and noticeably quiet. Breathing in can occur easily either through the nose or mouth. The sensation is one of comfort and moderation. From that point on, the sugar-burning/fat-burning distinction became the central feature of my own training philosophies. Your body can burn fat, and your body can burn sugar. If you really want to go the distance, you are infinitely better off burning fat. Myth No pain, no gain. You must suffer to get results. Reality Comfort is the key to sustainable growth. Myth Either you’re born to burn fat or you’re not. Reality You can train your body to burn more fat. The rest of our inherited muscle fiber type is divided between two types of anaerobic fast-twitch sugar-burning fibers: Type A and Type B. Type B accounts for the smallest percentage, about 13 percent, and are incredibly explosive yet easily fatigued. The remaining muscle fibers are Type A. These muscle fibers are also fast-twitch, but with some added stamina. In summary, nice and easy long runs or walks condition your body to rely more on slow-twitch, aerobic, fat-burning muscle fibers, and high-intensity exercise is likely to encourage the stimulation of the powerful sugar-burning ones. For the most part, how you set up your training sessions and what you eat determines where your body gets its energy. However, if you take your time to get going, your body will rely on its aerobic, slow-twitch muscle fibers that depend on fat as their main energy source. Also, your body tends to burn what you feed it. SUGAR-BASED ENERGY MAKES YOU ACIDIC Ask anyone who’s run a marathon about lactic acid and you’ll hear day-after tales of having to walk down the stairs backward or about quads that throbbed with pain. Dysfunctional adrenal glands can also inhibit the secretion of cortisone, the body’s natural anti-inflammatory medication. Without the cortisone, mild and natural inflammations resulting from physical training cannot be managed and controlled and can develop into major bodily aches and pains. How strong is your immune system? The answer is determined by how well you stave off colds and flus. I notice how often professional athletes are sidelined by cold ailments. It’s amazing how many people preparing for a big event get sick right before. High-intensity physical activity seems to produces large amounts of free radicals, by-products of energy production that can speed up the aging process. The most well-known antioxidants include vitamins A, C, and E, selenium, beta-carotene, bioflavonoids, taurine, the phenols found in red wine, and enzymes found in the mitochondria, the fat-burning ovens of the muscle cells. First of all, when you produce energy aerobically, by burning fat, you stimulate the growth in size and number of the mitochondria, the fat-burning “ovens” found in the muscle cells. Secondly, aerobic fat-burning activity increases your sensitivity to insulin. Increased insulin sensitivity means a diminished presence of this sugar-burning, fat-storing hormone, reduces the likelihood of hyper (high) insulin production, and promotes stable blood sugar levels. My training system is organized around these three possible heart-rate ranges that I call cardio c-quences. Your mostly aerobic pace, or the MAP cardio c-quence, is the most comfortable zone in which to train. In the MAP zone, you are aerobic and fat-burning. On the other end is the speedy anaerobic pace or the SAP cardio c-quence. In this zone you feel noticeably challenged, in a state of greater stress and strain, with a sense of urgency and alarm. During these times you enter the anaerobic world of sugar-burning. In between is a narrow middle zone that I call the most efficient pace or the MEP cardio c-quence. Thus, for me—and using forty-four bpm as my resting pulse—my training zone, according to HRR logic is as follows: For the upper limit: (220 – age – resting pulse x .80) + resting pulse As you can see, in this case both the HRmax and the HRR predict almost the identical target zone range: 120 (or 121) to 146. A single target zone doesn’t distinguish the range of experiences you have when you move. Most people are in one of three “states” when they move: comfortable and relaxed, working hard and straining, or somewhere in between—a place I call efficient and productive. Maffetone recommends subtracting your age from 180 to calculate the upper limit of your target zone. Subtract ten from that number and you have a ten-beat range within which to move. To account for individual differences, he adjusts the entire zone up or down in five-to-ten beat increments. The zone moves up by five to ten beats (see the chart on Stu’s recipe for heart-rate zones that follows) for healthy, well-trained endurance athletes, drops by five beats for those just starting out, and is lowered by ten beats for anyone on medication or recovering from a recent illness. For everyone else it stays the same. A well-trained forty-eight-year-old athlete like me would calculate the upper limit to a 10-beat zone as follows: 180 – 48 = 132. The 10-beat target-training zone becomes 122 to 132. Because I am an endurance athlete, I adjust the zone up by 10 beats for a target-training zone of 132 to 142. I make every attempt possible to schedule my MAP sessions in the morning. It leaves me feeling calm, excited, peaceful, and energized. The MEP must be sustainable, but not as effortless as the MAP. When it comes to performance enhancement, the MEP is the most significant of the cardio c-quences. The productivity you have in your MEP is the best predictor of your marathon time. Whatever pace (minutes per mile, or miles per hour) you are able to sustain while keeping your heart rate within the boundaries of the MEP, upper and lower limits tends to be the pace at which you can continue moving during a run of marathon proportions. Do not guzzle a big bottle all at once before you are ready to roll. Be mindful of the need to constantly and gently saturate the cells of your body with water. This means having a bottle of water by your side and taking small sips throughout the day as opposed to big doses at well-spaced intervals. As a general rule, drink at least one-half your body weight in ounces of water every day. Sip on water before, during, and after your movement sessions. You’ll know if you’re sufficiently hydrated if your urine is plentiful and clear. Fat that is not immediately needed for energy is put away for long-term storage. To get at this fat, your body must go through a “fat-mobilization” process before its fat stores can be converted into energy by the aerobic, slow-twitch fat-burning muscle fibers. It takes between seven and fifteen minutes for your body to mobilize fat. Giving your body time to transform its out-of-the-way fat stores into a utilizable fuel can be one of the most effective strategies for ensuring greater reliance on fat as an energy source during your workout and throughout your day.